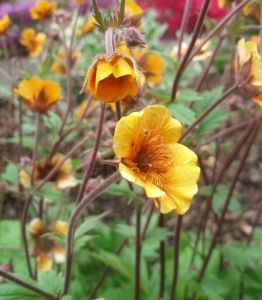 Geum 'Carlskaer' (Karlskaer) is a clump forming perennial with neat up facing soft orange flowers on dark wiry stems during June-July. Easy to grow. Hardy. Grows in sun or partial shade. Evergreen. Height 0.35m. Supplied in a 9cm pot.